Given enough time and with enough ingenuity, people can find long-term solutions for responsibly developing Earth's resources. In Canada's newest and largest territory, successful development of mineral resources is the key to progress. The second largest mining sector in the world, South Africa has a rich geological history that is responsible for the country's wealth of gems, metals and other minerals. Traditional approaches to remediate acid drainage from mining have failed to address a root cause: thriving underground microbial communities. To better manage resources in the United States, policy-makers need to understand the flow of materials from the time of extraction to use and disposal or reuse. The High Plains aquifer could be a casualty in a political battle to prevent coordinated scientific characterization of this important groundwater system. 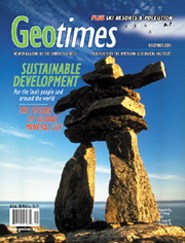 Engineering geologists play a crucial role in providing geological information to the public. Coffee is not only vital to the day-to-day functioning of geologists. It is also an important tool for modeling and understanding earth processes. An Inukshuk (ee-nook-shook) is a pile of stones that represents a person, as pictured here in Nunavut, the new Canadian territory for the Inuit people. These structures are traditional landmarks in the Arctic region, where there are no trees and few distinguishing features to use for reference while traveling. The orientation of the stones may also give guidance by marking a trail on the tundra. 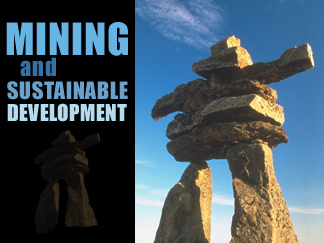 Read about development in the Inuit territory. Image courtesy of the Governments of the Northwest Territories and Nunavut.